Between the villages of Anloo and Schipborg is a nature reserve with a double name: De Strubben Kniphorstbosch. De Strubben lies where the fields of Schipborg meet the heathland. The Kniphorstbosch lies to the southeast where there are large open spaces which were formerly sand drifts. 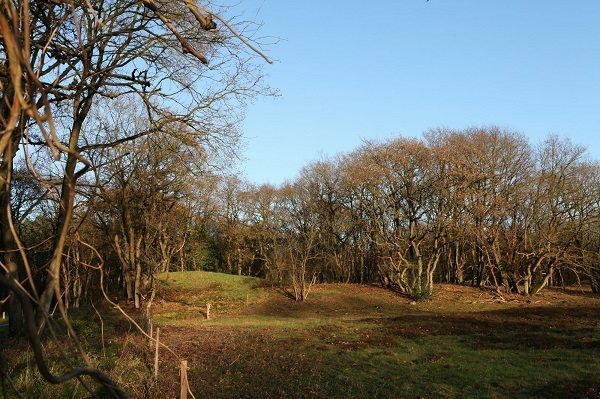 The Kniphorst family cleared the heath in this area and replaced it with a timber plantation. The area contains many archaeological monuments, including two hunebeds and dozens of burial mounds. You will also see ruts made by cart tracks in bygone centuries. Apart from the two remaining hunebeds built by the farmers of the Funnel Beaker Culture (3400-2850 BC), archaeologists have identified the locations of at least two further hunebeds. In De Strubben Kniphorstbosch you will also find dozens of burial mounds from just about all prehistoric periods. One of the largest mounds is called the Galgenberg or Gallows Hill. In the Middle Ages places like this were chosen to hang criminals. The authorities would let the body hang for days on the mound so that passers-by could see the fate that awaited wrong-doers. Since 2000, De Strubben Kniphorstbosch has been the first – and until now the only – archaeological reserve in the Netherlands. ‘Strubben’ woods are typical of the old Drenthe natural landscape. 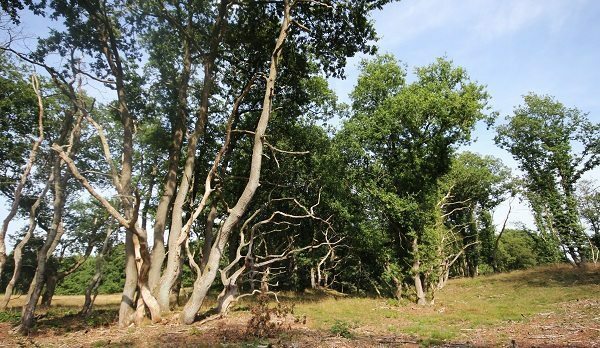 The word ‘strubbe’ means brushwood or scrub, often formed from low, fantastically-shaped small oak trees. Many of the heavy branches hang down and almost run along the ground. The strubben get their striking shape because the branches of the young trees at the edge of the wood were gnawed by sheep. Sadly the strubben woods close to most villages disappeared when the heathland began to be cultivated. The wood in De Strubben would be cut down after ten or fifteen years, often by so-called ‘oak strippers’. They would sell the bark to the leather industry for making tannin and sell the bundles of wood to villagers for firewood. New oak branches or ‘strubben’ would grow on the old tree stumps. After the sheep had left the heath, most of the ‘strubben’ woods in Drenthe became overgrown. A few years ago many of the trees here in De Strubben were felled in order to restore the open landscape of former times. The Kniphorstbosch dates from the second half of the 19th century. At first it was an estate with old-fashioned tree plantations. Over time this grew out into varied woodland with both hardwood and softwood timber. On the avenues to the right with beech trees or oaks on both sides you can still clearly see how the Kniphorst family laid out their woodland as a country estate. Staatsbosbeheer (Woodland Management Agency) does its best to maintain the original character of the wood. Here and there a few plots have been cleared to encourage the spontaneous development of new woodland.